Gentry puppies are bred with great attention to the genotype, phenotype, temperament, and health of the parents, grandparents and other members of the family .Breeding selections are carefully made to produce puppies that have the genetic foundation for proper conformation and good health. It is easy to produce an ugly boxer due to the special conformation of their undershot jaw. Note that our dogs do not show teeth or tongues and that they have the proper proportions required by the standard to produce a beautiful square body and head. We are Natural Rearing Breeders, which means that we subscribe to a natural protocol for whelping and raising our dogs. We feed a 100% raw diet, use homeopathic nosodes and Young Living essential oils for immune support, and use no poisons or chemicals (ivermectin, traditional wormers, etc.). Holistic methods (i.e. homeopathy; herbs; glandulars, etc.) are predominately used. (Conventional methods are used rarely only when appropriate). Owners and breeders who have feed their dogs a species appropriate natural diet have actually seen illnesses disappear, vet bills plummet and a new, healthier generation of dogs come into being. Our puppies are usually bottle fed raw goat milk once a day to give them the best start in life. This is one of the essential factors in the “people orientation” of Gentry dogs. Puppies that are bottle fed occasionally seem much better bonded to humans than those that are not. 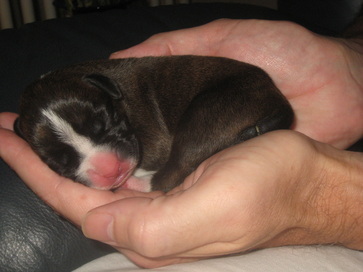 Bottle feeding is done to supplement, but not replace, the essential contact and nursing provided by the puppies’ mother. We run the "Bio Sensor Super Dog" protocol from the birth through the age of 16 days. This protocol can only be done by a breeder in the nursery because it must be completed during a specific development phase. This stimulation protocol may improve performance and strengthen immune system. We take our babies through a program called Puppy Culture starting at 3 weeks of age. They learn how to face fears, deal with challenges, conquer obstacles, go through tunnels with dark ends and go over puppy agility equipment. They are exposed to a huge variety of environments, people, floor surfaces, noises, smells and sights. They are taught not to guard their food or toys by offering higher value items in exchange for them. This is done methodically and changes each week as they grow. They are taught to respond to positive training clicker markers and are reinforced with treats and affection for desired behaviors. Unwanted behaviors are redirected or ignored. We never raise our voices or use punishment or force techniques. We have found that this program produces puppies who are able to adapt to changing situations more easily, and they are primed to continue training with gusto in their new homes. Gentry puppies are raised in a clean indoor environment to form the dog’s foundation to want to stay clean later in life. Potty training is begun and they are exposed to sleeping in a dog kennel (airline crate) so that they can adapt easily to homes where kennels are used for housebreaking and containment. We play with and handle our puppies often to socialize them and accustom them to handling of their bodies and feet. We begin cutting their nails before their eyes are open and expose them to nail clippers and dremels so that this is not a new experience for them. We run a daily loop of common sounds to "desensitize" puppies. These sounds include such things as doorbells, dogs barking, children crying, fireworks, crashing noises, cats fighting, etc. We start with the sounds extremely low and run them a little louder each day until they are of normal volume. The premise behind desensitizing is that the dog hears this as white noise and is less likely to be reactive to these sounds later in life. We also begin basic obedience training using positive reinforcement techniques. We use an Early Development Puppy Gym to give them stimulation, challenges, and FUN FUN FUN!!! If you may be interested in applying for a Gentry puppy, consider joining our Facebook page called "Gentry Boxers Natural Rearing Group" to learn more about the benefits of natural rearing.